Sutton Mercer had a life anyone would kill for - and someone did. But thanks to a view from the afterliffe and Emma Paxton, her long-lost twin sister, Sutton has a chance to solve her own murder. In a story that's part Lovely Bones and part Pretty Little Liars, Emma slips into Sutton's old life to piece together her disappearance. But can Emma keep up the charade long enough to discover what really happened to Sutton . . . or will she become the next victim? Let the lying games begin. Emma Paxton has spent most of her life being shuffled from foster home to foster home. When she stumbles across the existence of Sutton Mercer, who just may be her long-lost twin sister, Emma packs up her things and runs away from her latest foster home to track her down. The problem is, Sutton doesn't show up at their designated meeting place, and everyone thinks Emma is Sutton - even the police. After receiving a note telling her to play along, Emma decides to solve Sutton's disappearance. She'll have to tread carefully, though, because if anyone starts to believe that she isn't Sutton, Emma may be the next one to disappear . . . I won this ARC of The Lying Game through Goodread's FirstReads program, which was very exciting because I've had it on my wishlist for a long time! It was a little different than expected, but I still enjoyed it. The biggest thing different about it is the point of view. Technically, The Lying Game is from Sutton's point of view in the afterlife, but it actually reads like a third person story about Emma with short, sporadic bursts of internal dialogue from Sutton. I loved the mystery aspect of this story and the fact that it could have been anyone that killed Sutton. Can't wait for the next installment! 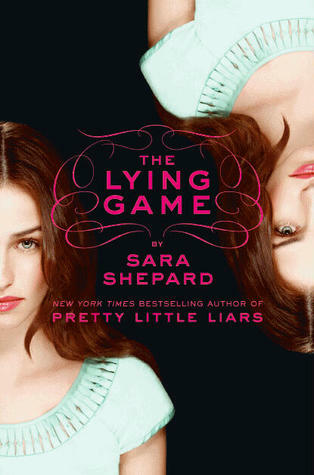 The second book in The Lying Game series, Never Have I Ever, will be released April 2011. Sara Shepard is also the author of the Pretty Little Liars series: Pretty Little Liars, Flawless, Perfect, Unbelievable, Wicked, Killer, Heartless, & Wanted.